A Janet Boeing 737 at Las Vegas in 2011. And there are the more elegant callsigns, like “Speedbird” for British Airways flights, Aer Lingus’ “Shamrock,” or “Dynasty” for China Airlines. It’s a callsign shrouded in mystery, for an airline that really isn’t an airline, with a fleet that bears no logos, based in plain sight of everyone flying into, driving by, or sitting in a hotel room overlooking Las Vegas’ McCarran International Airport. Janet has an airline code and flight numbers that can be tracked just like regular commercial planes. It takes off and lands with the regular civilian traffic taking people into and out of Vegas. But you can’t buy tickets on it, and you most certainly can’t fly on it — unless you are a US government employee or contractor with a very, very high security clearance. Janet isn’t even its real name. In fact, it does not officially have one. And what it does, as far as we know, is ferry people to some of the most secret government sites in the US. It does so with a fleet of a half-dozen non-descript Boeing 737-600s, plus a few Beechcraft 1900s and King Airs, which can be seen on the LAS ramp in front of a simple terminal building, in a highly secure compound. Secure, because the fleet’s destination is often the fabled Area 51, on Groom Lake, a short 25-minute flight from LAS. Area 51, also known as Dreamland, has been home to “black” or highly secret aviation programs dating back to the 1950s. It’s the place where high-flying U-2s and Lockheed A-12s were secretly flight-tested. That’s where the F-117 Nighthawk stealth attack aircraft was flown and hidden from view for years, before its debut in the 1991 Gulf War. And now? Who really knows what aircraft are hiding in the hangars at the super-secret facility. But we do know that it takes people to staff those programs. That’s why those who observe this stuff believe that there are between 1,000 and 1,500 people who board the Janet planes in LAS and are flown to and from Area 51, to work on projects that they can’t, and very much don’t, talk about. Janet’s six Boeing 737s were previously flown by Air China and are painted white with a simple red stripe along the window line. Other than a civilian N-number, the planes have no identification. The fleet also flies to the Tonopah Test Range, about 140 miles northwest of LAS, and to other bases and facilities in the region. Area 51 was originally established by the US Central Intelligence Agency in the 1950s, as a remote, secure airport for testing of the most advanced reconnaissance aircraft of the time, the Lockheed U-2. “It was sort of a joint Air Force/CIA effort,” says Trimble. “It was also home base for Project OXCART in the 1960s.” That ultra-secret program included the Lockheed A-12, the precursor to the US Air Force’s SR-71 Blackbird. As far as we know, to date, no air-breathing jet has flown faster than the spyplane designed to skirt the Soviet Union at more than 2,200 mph. “In the early 1970s, authority over the base transferred from the CIA to the Air Force. That was when the existence of the base became known. Until then, we had no idea. When the U-2 suddenly appeared, we had no idea where it had been flight tested,” says Trimble. In the earliest CIA days, employee shuttle flights were operated by the USAF from the home of Lockheed Aircraft in Burbank, California, and Las Vegas, primarily with Douglas C-54 military prop planes. In the early 1970s, the shuttle operation was transferred to defence contractor EG&G, which transitioned the fleet to Boeing 737-200s. Through ownership changes, Janet is now the responsibility of AECOM, a company that describes itself very vaguely as “a global network of design, engineering, construction and management professionals partnering with clients to imagine and deliver a better world,” with revenues of $18 billion in 2017. AECOM recently posted a job opening for “First Officer, Co-Pilot, Las Vegas, Nevada,” in the company’s “Government” business line. The preferred qualifications for the position include Boeing 737 type rating, Boeing 737 experience, and high-performance and/or jet aircraft experience. The posting doesn’t make any reference to Janet, but candidates “must qualify for and maintain a Top Secret government security clearance and associated work location access.” It’s pretty obvious that what they’re looking for is Janet drivers. This might be a pilot’s dream job. Other than dodging the occasional bad weather in the region, the flight legs are short, and the crews are probably home in Las Vegas every night. There’s little doubt that the competition for these positions is fierce, and the hiring process must be incredibly challenging. Years ago, I was on a corporate flight to Las Vegas, and I chatted with the pilot about Janet. He told me that his father, a retired ex-USAF senior pilot with extensive military and commercial experience and who had the “highest of the high” security clearances, applied to become a Janet pilot. He didn’t get the job. And if even he could not score a spot at the “airline,” then it must be really, really hard to get in. Some think that it’s an acronym for “Just Another Non-Existent Terminal.” Others say it may stand for “Joint Air Network for Employee Transportation.” Still others say that it’s a typically cryptic, or just made up, military code name. But according to the Nevada Aerospace Hall of Fame, Janet was a real person. “It actually originated on the whim of a former Area 51 commander. Richard A. Sampson, who commanded the base from 1969 through 1971 picked his wife’s name to identify the EG&G commuter planes that ferried workers in from Las Vegas and Burbank. The JANET call sign has seen continuous use ever since,” explains the Hall of Fame’s website. 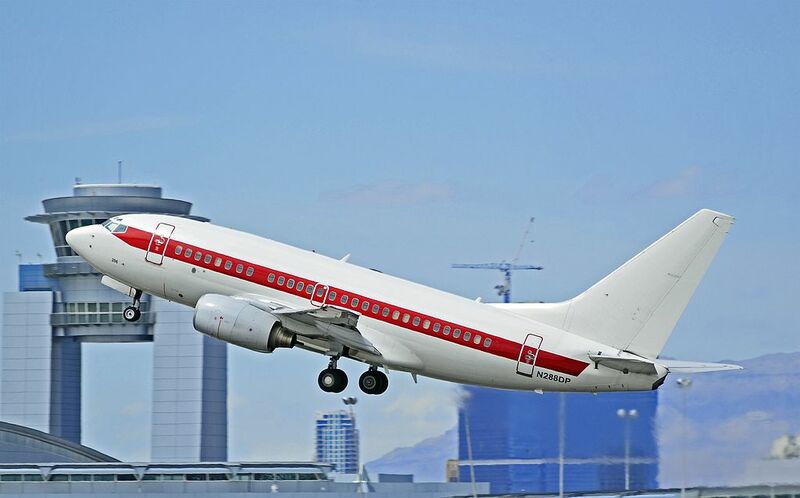 So next time you’re in LAS, keep an eye out for the Janet planes, and wonder: Who’s aboard? Where are they going? And what secrets do they know?